This article is dedicated to Robert Navaratnam and Alphonsus Chern, without whom it would not have been possible, and through whose kindness and passion for their art I partook in many unforgettable experiences. The text below is adapted and updated from my 2005 article in The Organ magazine (vol. 334 pp. 8—10), with additional photography and links to multimedia, about the organs of the Cathedral of the Good Shepherd in Singapore. As back issues of magazines are generally difficult to find, I decided to make my writing available online to let more people know about this very special instrument. Singapore is a small tropical island state with only eleven functional pipe organs. Like the cosmopolitan population, however, these instruments constitute diverse styles. Despite having been a British Crown Colony until 1959, Singapore boasts not only English but also German and Danish instruments with romantic, neo-baroque and eclectic tonal concepts. Welch (1988) provided a brief account of most of the organs in Singapore; see also my complete survey of organs in Singapore in 2005 (go to p. 4 if your browser fails to auto-scroll). 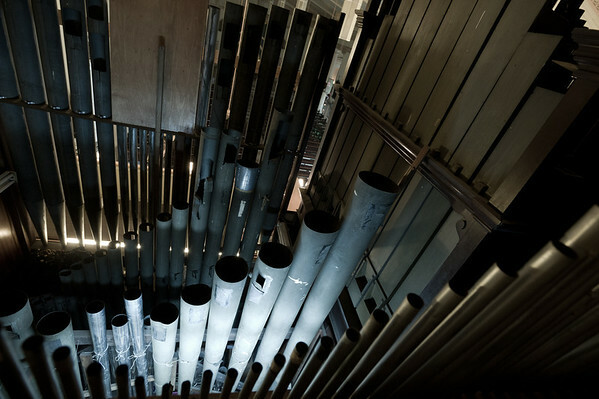 In the present article, the organs of the Cathedral of the Good Shepherd are examined for their architectural and musical significance. The organ in the west gallery stands out in several respects. 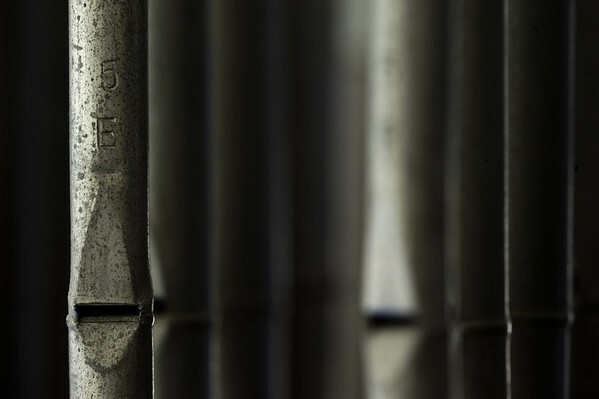 Although the Klais installation of 2002 in the Esplanade concert hall (McVicker 2003) might be considered the 'industry standard', the cathedral instrument possesses artistic traits that are less conventional. Welch (1988) suspected that the organ was the Cavaillé-Coll orgue de choeur exported to Singapore (Eschbach 2003), but cathedral records subsequently revealed that the organ was built in 1912 by Bevington & Sons of London. The non-extant Cavaillé-Coll instrument has been traced to the French missionary church of Saints Peter and Paul. Asymmetry is a key aesthetic element of the façade that is not seen elsewhere in Singapore. Only the symmetric central section, typical of organs of the period, is Bevington’s work. 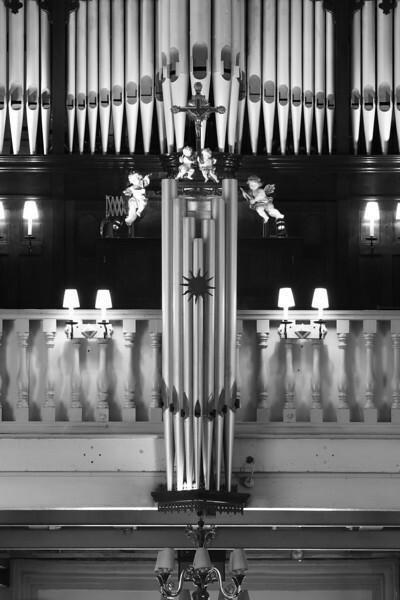 The left and right sections of the façade were constructed by Robert Navaratnam, the sole organ builder in Singapore and titular organist at the Cathedral, using the limited resource of pipes that could be salvaged from the war-looted Hill, Norman & Beard (1931) organ in the Victoria Memorial Hall (Singapore). These sections accommodate stops added by him in the 1990s. Navaratnam served his apprenticeship at Emil Hammer (Hemmingen); German influence can be found in the decorative ‘Rückpositiv’ and the tonal modifications discussed later. Although the manuals and pedals have been replaced, the Cavaillé-Coll-style reversed console is original and unique in Singapore. [The original Bevington manuals had been replaced with those from Victoria Memorial Hall. 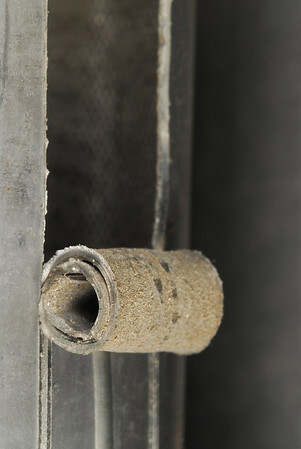 Subsequent to this article, they were again replaced due to wear and tear.] Due to collapsed lead tubing, the Bevington tubular pneumatic action has been converted to electro-pneumatic and direct electric action (see Jonathan Tan's article for details). 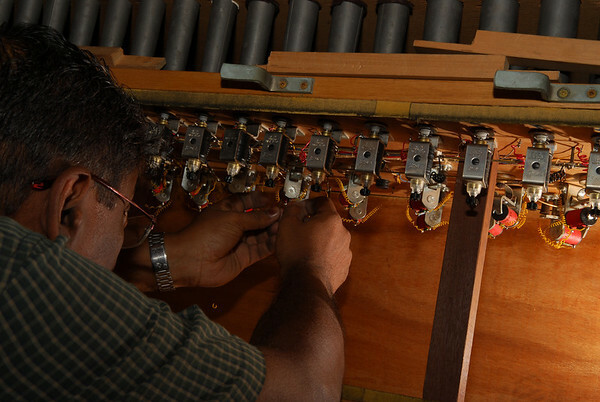 Navaratnam was responsible for reviving the organ from its unplayable state in the 1970s to the lively musical instrument of today. Expectedly, an abundance of unison tone and lack of harmonic corroboration is observed in the Bevington specification. The ‘principal chorus’ on the Swell is softer but brighter than that on the Great because the Open Diapason possesses a fuller tone than the quasi-diapason obtained by drawing both the Gedeckt and Geigen on the Swell. Contrary to usual practice is the employment by Bevington of the Cornopean as the only reed where a Trumpet or Oboe would have been generally deemed more appropriate. In this case, however, the hornlike Cornopean blends more readily with the flues in the absence of mixtures. Disposition as of 2005, compiled by Yangchen Lin from interviews and historical documents. Reproduced from the magazine article. Physical layout of the stops as of 2005. Diagram: Yangchen Lin, reproduced from the magazine article. The manual divisions and Bourdon 16 are fed by two reservoirs arranged in series, the second acting as a booster and backup. Bevington pipework stands on the original Kegellade while the newer pipes are planted on unit chests. Flutes alternate with strings to minimise acoustic interference. Pitch layout in the Swell is opposite to that in the Great, with the more acute stops situated at the front. This reduces the risk of the Swell upperwork being excessively attenuated by enclosure and the position of the swell box at the back of the chamber. However, the brightness of the German Cymbel and mutations allows for their placement in a rearward extension of the swell box. The opposing pitch layouts of the Great and Swell may also account partly for the abovementioned brightness of the Swell ‘principal chorus’ compared to the Great. 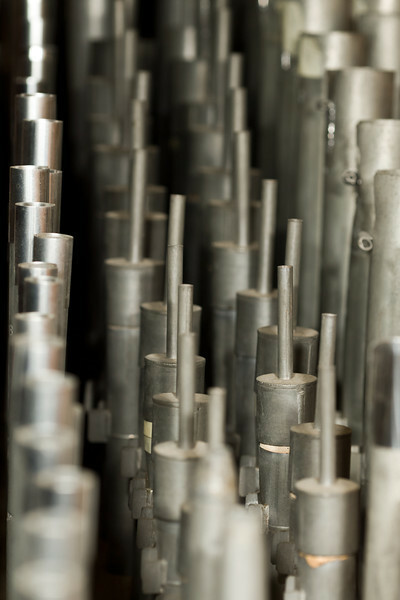 With the stops added by Navaratnam, the organ is one of the most versatile in Singapore. 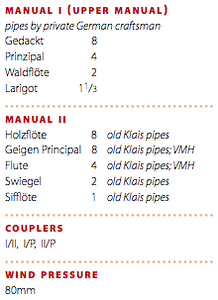 Solo possibilities are increased by the Krummhorn and the quint and tierce mutations all of which are gifts from Klais Orgelbau. The two octave-quint mixtures transform the romantic chorus into a neo-baroque plenum for the benefit of repertoire and modern-day congregational singing. 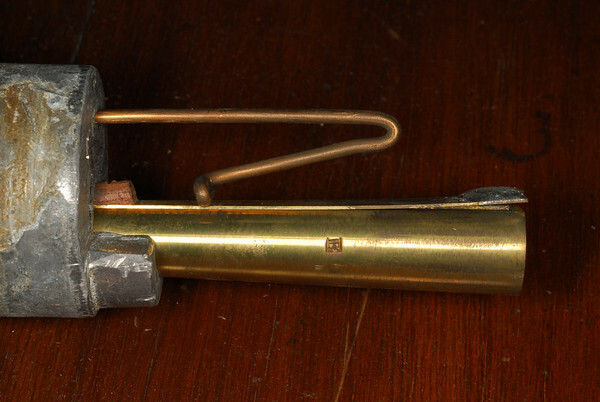 One of the stops rescued from the Victoria Memorial Hall is the Bombarde 16 [originally named Trombone, being less assertive within the larger instrument there] which substantially reinforces the weak pedal department. This stop, originally on 10" of wind, has been refitted with thinner Laukhuff tongues. [Subsequent to this article, the ageing Bombarde was replaced with all-Laukhuff pipework.] 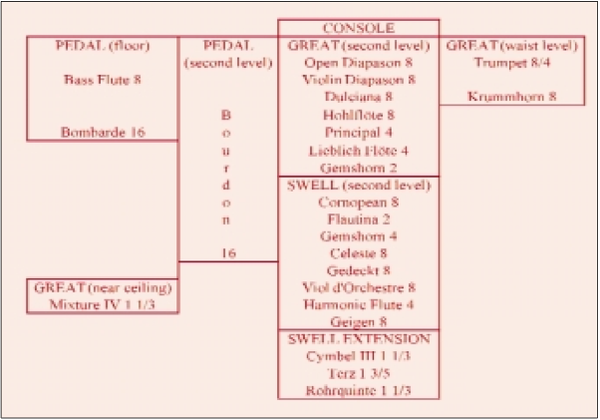 Despite the support of a pedal reed, however, a Principal 16 is needed to produce the true Gravität so prized by J. S. Bach. 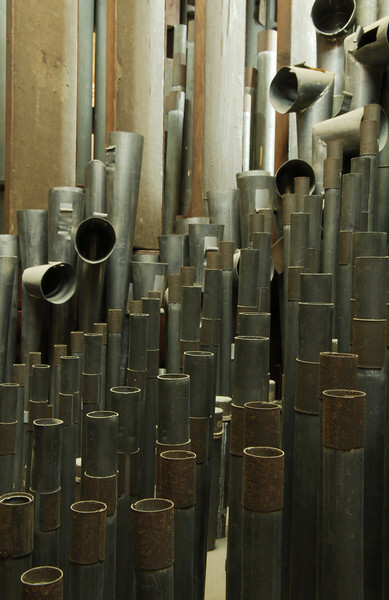 The coexistence of pipes from several schools (see disposition) results in a spicy, unblending tonal structure that may not appeal to some organists. However, in order to appreciate such a tonal structure, one only needs to consider the robust and dramatic sound of the symphony orchestra whose components were never ‘voiced’ to blend together. Anton Bruckner, whose monumental symphonies are based on organ textures, relied on the contrasts between orchestral instruments to promulgate musical ideas. 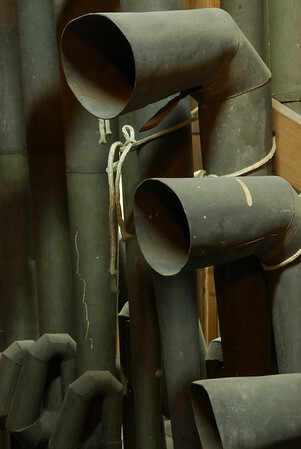 Notwithstanding the tonal disjunction, the Bevington portion comprising the oldest playing pipes in Singapore can be heard in its original state except the Cornopean stolen during the war and the Swell Gedeckt 8 whose cork stoppers have disintegrated and been replaced with metal caps. The present Möller Cornopean, donated by The Diapason contributing editor Robert Coleberd, is the only specimen of the American Classic style in Singapore. Complementing the main instrument is a choir organ built in 1994 in the north transept. The case is the only complete example of Navaratnam’s work. Werkprinzip elements are present in the façade in the form of Brustwerk, Oberwerk and diminutive ‘pedal towers’. These, however, do not reflect the internal layout. Reminiscent of mediæval organs are the flat placement of pipes and the arrangement of pipe mouths in horizontal lines. The case has a triangular roof and stands on four stilts, much resembling the traditional kampong (village) houses found along the rural coasts of Southeast Asia. This scheme saves space, aids sound projection and achieves a pleasing synthesis of Europe and the Far East. Disposition of the choir organ as of 2005, compiled by Yangchen Lin. Reproduced from the magazine article. 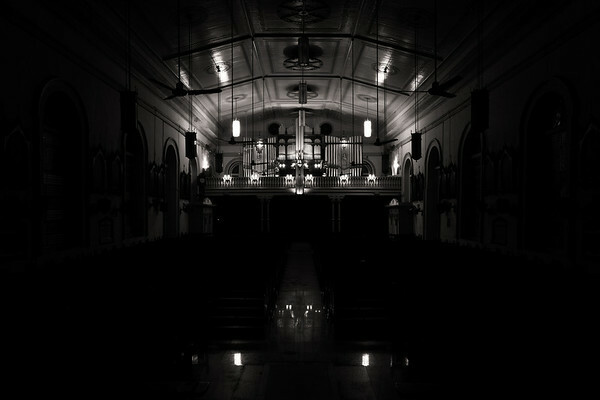 Being the only acoustical space in Singapore containing two organs, the Cathedral is the only place where antiphony is possible. Magnificent effects can be created by juxtaposing the two sound masses emanating from opposite ends of the nave. Furthermore, the nave is the most reverberant among the Singaporean churches possessing pipe organs. 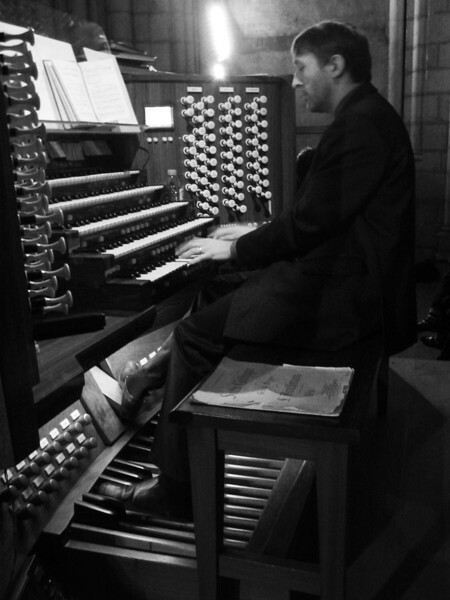 Antiphony was recently demonstrated by the author and the cathedral organist in an unusual performance of the Introduction of Léon Boëllmann’s Suite Gothique. The Grand-Chœur sections were played on the gallery organ in alternation with the Récit sections played on the choir organ. 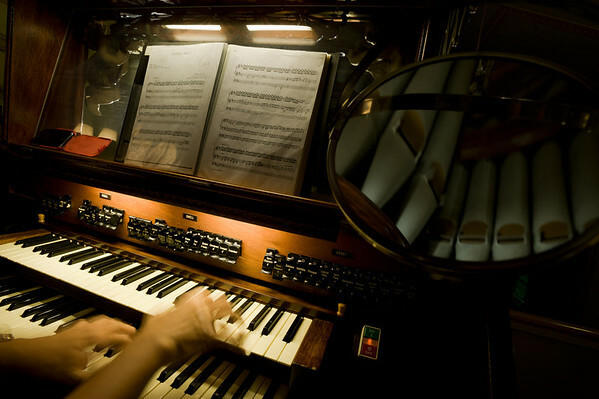 It re-enacted an electrifying performance by Olivier Latry, Titulaire, that the author had witnessed in the organ loft at Notre Dame cathedral in Paris (see a photo of the organ's interior). Just as Singapore as a nation has grown from cosmopolitan roots, the organs of the Cathedral of the Good Shepherd have evolved into a harmonious amalgamation of diverse tonal origins heralding the emergence of the 'Singaporean organ' alongside the English, German, French and other organ building traditions. 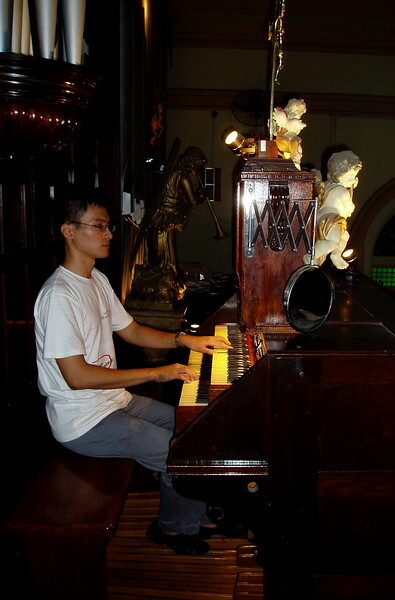 The 'Singaporean organ' is capable of making great music under the command of great musicians, and is worth preserving as an element of Singapore’s kaleidoscopic cultural heritage for the enjoyment of future generations. I am indebted to Robert Navaratnam, Father Adrian Anthony (cathedral rector) and Alphonsus Chern for their assistance. Bevington & Sons Work Book 1905–1931 (Birmingham City Archives MS1963). Eschbach, J. 2003. Aristide Cavaillé-Coll Vol. 1: Compendium of Known Stoplists Paderborn: Peter Ewers. McVicker, W. 2003. Dream palace. Choir and Organ 11(3):30–35. Welch, J. 1988. Organs in Asia. The American Organist 22(7):42–50.